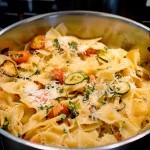 The recipe is simple and easy to prepare. 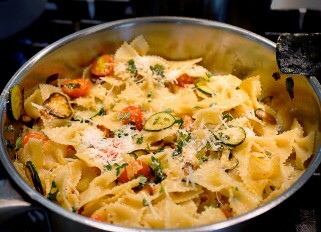 Fry the zucchini and tomatoes over high heat, stirring all the time, so vegetables will stay slightly hard and crispy. If you have pine nuts, sprinkle them on top of the prepared dish. Cook the pasta as directed on the package, to al dente, then drain the water. 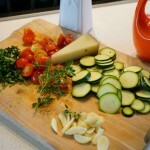 Slice the zucchini and cut cherry tomatoes into halves. 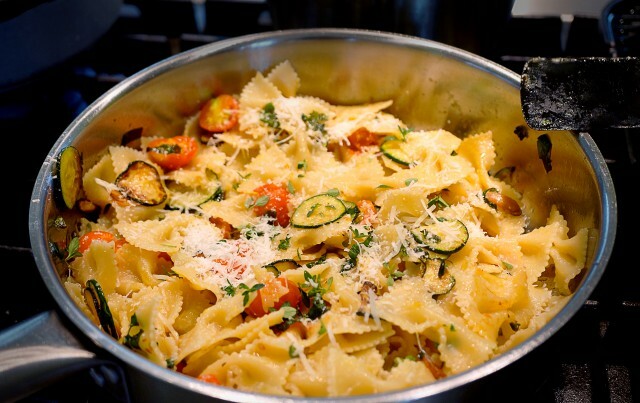 In a wide pan heat the olive oil and fry the sliced ​​garlic cloves and zucchini until slightly golden brown, add the tomatoes and basil and fry for 2-3 minutes, stirring all the time. Add pasta, olive oil, and cook for 2-3 minutes, stirring all the time, add the grated cheese, thyme leaves, stir and serve immediately.